Lana Condor smiles when she speaks. I’m positive, even though our interview takes place over a call and I’m staring at my scratched-up iPhone screen instead of her surely beaming face. There’s an unmistakable lilt to her voice—a slight upward curve in the way she enunciates and how she ends each sentence in a distinctly buoyant timbre… Yes, she’s definitely smiling. That, and she’s constantly bursting into peals of laughter, which pepper our discussion like living, breathing exclamation marks. Not to say she isn’t taking my questions seriously. More, Condor seems to be brimming over with unsullied joy, which amalgamates every few minutes in the form of a laugh—too much effervescence to be bottled up in her 5’3” frame, to get lost in the static of our phone connection, or to be masked by any vague, performative aloofness. Not that she would ever try. 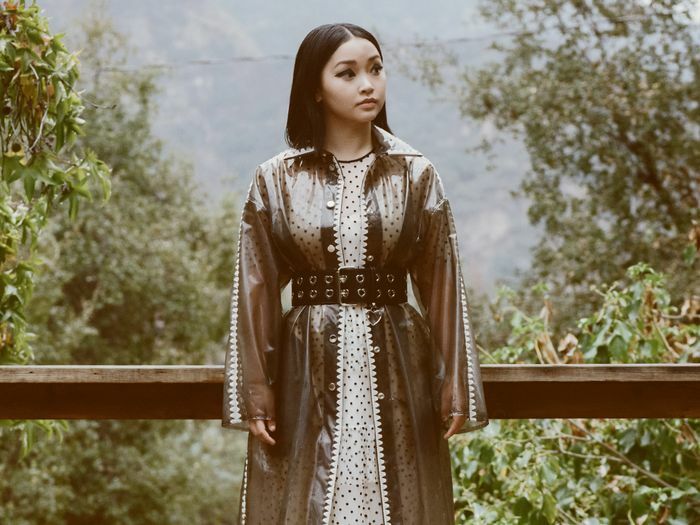 If Lana Condor is any one thing, it’s sincere. She credits the part of her childhood spent on Whidbey Island—a tiny Washington region she describes as a place “where everyone has a farm and animals”—for keeping her from falling prey to Hollywood’s shiny, plastic, often vacuous value system. Grounded, cheery, raised by two loving parents on an island with a population of less than 80,000—Lana Condor is the modern girl next door, which makes it feel all the more fateful a girl-next-door role would be the one to skyrocket her to fame. In case you missed it: On August 17, 2018, Netflix released a film called To All the Boys I’ve Loved Before, much to the delight of, well, anyone with a heart. Based on Jenny Han’s YA novel of the same name, it tells the story of high school junior Lara Jean Covey, who would rather dream up fantasy scenarios with her crushes in her mind and pen them love notes in secret than approach them in person—until the day she discovers all her letters were mysteriously sent to said crushes… all at once. The rest of the film documents the ensuing changes in her relationships with family, friends, and, naturally, all the boys, one of whom—cool-kid-with-a-conscience Peter Kavinsky, played by the tousle-haired, sleepy-eyed, now-certified-heartthrob Noah Centineo—ultimately leads to her stepping outside of her dream world and taking a chance on love. Cue wistful sigh. To say the internet lost its mind over this teenage love story might be an overstatement, but I’ll say it anyway: The internet lost its mind over this teenage love story. Something about the heartfelt high school rom-com struck a collective nerve in viewers who’ve ever experienced the stomach-dropping, mind-altering, butterfly-inducing feeling of a full-blown crush. Maybe it was the palpable chemistry between Condor and Centineo, who stare at each other with such innocent longing it’s hard not to feel your own heart twang for days of teenage love gone by. Maybe it was the virtue of a love story where the most risqué scene was a hot tub kiss that ended with a tender hallway goodbye. Or maybe we all just needed something pure and sweet and good to distract us from the dire, never-ending slough of reality. Whatever the reason, the film quickly joined the ranks of such zeitgeisty, cult-loved predecessors as High School Musical and Twilight, with rabid fan bases spawning overnight for its two young co-stars. Condor’s own Instagram quickly grew from about 100,000 followers to over 5 million. On top of all the above was the added element that Lara Jean Covey has one key difference from female teen leads past: She’s Asian American. Historically, Asian roles have been grossly underutilized in Hollywood—when included at all—either playing into one-dimensional, often racist stereotypes or being completely whitewashed. Some recent examples: Scarlett Johansson’s role as Motoko Kusanagi in the live-action film adaptation of Japanese anime series Ghost in a Shell, Tilda Swinton as the Ancient One in Doctor Strange, and Emma Stone’s half-Asian Captain Allison Ng in Cameron Crowe’s Aloha. According to UCLA’s 2018 Hollywood Diversity Report, less than 3.1% of film roles in 2016 were held by Asian actors, and rarely in leading roles. The outdated (and disproven) notion that mass audiences don’t care to see more diverse casts could be partly to blame, but the notion that there is any single “Asian American experience” to draw from could be another. Because of Condor, an actor who was adopted in Vietnam as a baby and raised by two Caucasian parents, the latter may be changing. She insists that just because her Asian American experience doesn’t exactly mirror the traditional one doesn’t make it any less legitimate. I happen to agree. What’s not silly is that we’re finally seeing Asian representation in Hollywood at all, and that Condor’s success could ignite a dream in young girls who are seeing themselves in a leading role for the very first time. None of this is to imply Condor has never felt like an outsider. She reminisces on the first time someone called her and her brother, who was adopted from Vietnam alongside her, a derogatory name. (“I remember coming home one day from school and being like, ‘Mom, what does this mean?’” she tells me. “She was so upset and frustrated. That was the first time I was fully aware that my brother and I didn’t look like my parents.”) She recalls family road trips where hostesses could not seem to comprehend that two Asian children were meeting their white parents for dinner. Taking her rebuff in stride, she enrolled in a series of acting classes and tried again two years later. The rest fell into place quickly. “I got represented and—” she trails off, pausing. “I think I just got really lucky. Honestly.” By lucky, she means that she immediately booked her first movie (a little film you might have heard of called X-Men: Apocalypse) and from there had a few parts in smaller films before landing the coveted role of Lara Jean. It goes without saying—and it isn’t lost on Condor—that the road to stardom is not usually this smooth, nor does it typically happen so quickly. She uses the word “lucky” a few more times while describing her career trajectory, but of course pure luck is never the lone ingredient in any success story (there are enough broke Powerball winners out there for proof). Watch any interview with Condor—highly recommended if you’re looking for a serotonin boost—and you’ll see there’s something else about her allure entirely. Part of it is that smile-speak thing she does. Part of it is her childlike optimism, wherein no goal feels too grandiose. The thing about Condor is that she seems genuinely thrilled and in wonder of where life has taken her—like she can’t believe her fortune, but also wouldn’t expect anything else. It’s an almost physical energy, emanating off of her so viscerally you don’t even need to see her to notice it (case in point: that smile-speak thing I pick up on during our call). I can’t help but envy it, just a little. In a generation where an air of unperturbedness can feel like hard-won currency, Condor’s sincerity and complete lack of jadedness catch you off-guard—it could be grating if it weren’t so damn endearing. Whether she’s gleefully discussing her personal style (“I love, love, love, more than anything in the world, menswear!” she declares. “I love wearing oversized suits, I love pantsuits, I love high collars”) or woefully recalling the time her Disney Channel–obsessed middle school self stayed up all night and applied to every random website promising to turn her into a star (she didn’t hear back, but it all worked out in the end), Condor punctures every anecdote with a winsome giggle or that peal of laughter—often both. Lana Condor has just told me that she likes to make ratatouille because she loves the movie about a rat who dreams of a chef, and somehow it seems completely reasonable. More of the Condor effect ensues when I ask about her future dream role. “You know Andrew Garfield in Hacksaw Ridge?” she asks me without skipping a beat. I say I do. “Well, I’d love to play him, but the female version.” Come again? “I wanna do a war film!” she insists. “I’ve watched Hacksaw Ridge so many times and I love the characters, and I have this fascination with war films and that’s what I want to do next. So we shall see!” She giggles again. I think Condor’s optimism is rubbing off on me, because strangely, I’m nodding along, and the idea of an Asian American female playing the pacifist war hero in a WWII flick doesn’t sound so outrageous. Why shouldn’t she? I tell her I’ll put the thought out in the universe for her, to which she breathlessly responds, “Oh my gosh, thank you.” Alas, complete sincerity. I’m starting to realize that perhaps Condor is right about the whole Asian American experience thing. Maybe the new Asian American experience can’t be defined in any way other than knowing that you are different but—despite this knowledge, because of this knowledge—can accomplish anything you want. An Asian American woman playing a World War II hero? Why not? An Asian American hosting an Italian cooking show? I’d sure as hell watch it. A rat becoming a chef? Maybe not. Either way, to see the world through Lana Condor’s eyes is to see it through rose-colored glasses. Except—plot twist!—it turns out there aren’t any glasses, and in reality, the world was rose-colored all along; it was all the rest of us who were seeing it in black and white. Let Condor’s life serve as proof that what you project—in her case, boundless optimism and the belief that no dream is too big or off-limits, that it is, in fact, your God-given right to pursue such dreams, or change your mind, or use them to learn and grow into other dreams—is what the universe will bring to you. Meanwhile, we’ve segued back on the topic of suits. “Who frickin’ knows?” she exclaims halfway through discussing her love for menswear. “Maybe tomorrow, I’ll wake up and be like, I want to wear all the dresses. But for now, I love suits.” Suits or dresses; war hero or girl next door. In Condor’s rose-colored world, you never have to choose.